Just Comment: Destination World - What are you thankful for? What are you thankful for? 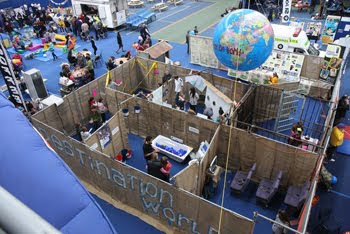 Winton Corps set up Destination World at the Southland Kidz Expo in Invercargill, it was an interactive journey around the world helping children in Southland to experience something of life for children in developing nations. During the weekend we had thousands of children visit the experience. They got to carry and pump water, experience child labour for a couple of minutes of moving bricks, walk though a mind field, visit a Mercy Ship travelling around the Pacific offering health care and ended up in a Mongolian prison cell. In the final room children and parents got to talk about the experience and record things they are thankful for. One mum recounted the experience that brought her to tears, her 5 year old daughter began writing what she was thankful for, by saying her jewellery, but quickly realised there was a lot more important things in the world, and was soon asking how to spell water, a safe house, daddy, mummy, my little sister and so on. It’s a challenge when we live in a world where some have so much, and others have so little. If you are reading this, then you are most likely one of those with much, so take a few moments to think about what you are truly thankful for, perhaps you could post some thoughts in the comments. Of course we now have a complete set up if anyone to do a similar set up at another event let us know!